Is the 2.5 Billion Pinterest valuation crazy? This week there was some shocking news from digital scrapbook site Pinterest- a 2.5 billion valuation and a 200 million funding round. Are these just crazy numbers for a site that has no ads, no dues, and no announced projected revenue source? Pinterest is now worth more than publicly traded Internet companies Zynga Inc. (ZNGA), Yelp Inc. and Pandora Media Inc., even though it has yet to generate revenue. This entry was posted in Tech news of the weird and tagged freemium model, pinterest valuation, startup valuation, tech boom on February 27, 2013 by Suzanne Forbes. On San Francisco’s Pier 9, Autodesk jumpstarts 3D printing of human skin. Bay Area 3D design software giant Autodesk is expanding its San Francisco office space. We told you that 3D printing is about to blow your mind, and Autodesk is very much in the game with their savvy acquisition of Instructables (which will be headed up from this location) and their December announcement of partnership with bioprinter Organovo. This entry was posted in Tech news of the weird and tagged 3D organprinting, 3D printing, additive manufacturing, Autodesk SF office, autodesk sf waterfront, BioCurious, biohacking, bioprinter, DIY bioprinter, Organovo on February 15, 2013 by Suzanne Forbes. Remember the good old days of Webvan? Instacart does. Back in 1999, you could order groceries delivered to your door from Webvan. But most people just ordered a six-pack of soda and didn’t tip the free-delivery guy. We had friends who worked there; it was great. Then they lost a billion dollars. In 2000, my email tagline was “I can’t hear you over the sound of Nero fiddling”. We gave a Halloween party in the cannon-testing range at the Alameda Naval base in 2001, with tombstones for all the dotcoms that had failed. San Francisco’s giant frat rager was over. But living in the Bay Area these days feels a bit like those days, if you have friends at the high-flying companies and your partner works at a startup that might be a contender. And there are already casualties littering the field. If a company that raised a 5M initial round and was founded by three ex-eBay execs couldn’t back the right horse (social local commerce and F-commerce are very young) then why is SF-based Instacart trying a business model that already drastically failed? Especially in SF, where consumers have numerous online grocery delivery options? Safeway delivers groceries (using some of Webvan’s old trucks!) SPUD will bring you organic local etc. veggies, or you can Mechanical Turk it with Taskrabbit. I learned about Instacart during a New Year’s Day conversation with a bright young thing from Dropbox, who told me the instant delivery (one-hour to same-day) arms race means the restless ghost of 90’s ecommerce delivery sites is roaming the streets of SF again. If you’re a young person who doesn’t work for Google (we know a Google employee who has turned his Mission kitchen into the litterbox room for his cats) but still makes tech money, your time is worth way more per hour than any delivery fees. On-demand courier and personal assistant services like Postmates and Exec are a practical solution for young urban singles who don’t want to deal with things like picking up drycleaning (or may not get home from work before the drycleaner closes) and don’t have a homemaker spouse. Is hiring out waiting in line at Tartine or Ike’s a douche move, a gratuitous flourish of privilege, or is it trickle-down economics at work? And why does Instacart think they can deliver groceries to anybody besides the neo-digerati? Well, they’re Y Combinator-incubated, for one thing. And they have an elevator pitch that doesn’t sound insane. Founded in early June, Instacart is the brainchild of Apoorva Mehta, an ex-Amazon Supply Chain engineer, who is leveraging his experience building Amazon’s own complex backend logistical system in the hopes of creating a more efficient back and front-end grocery delivery experience at Instacart. To begin with, Instacart CEO Apoorva Mehta said, the company is avoiding mistakes made by high-profile dot-com boom era failures like Webvan and Kozmo. Instead of offering unlimited free delivery with no minimum order, like Kozmo did, or building a billion dollars’ worth of grocery fulfillment infrastructure, Instacart simply takes customers’ $10 or larger orders, sends a staff shopper to a local merchant to load up on fruits, vegetables, meats, and the like, and then delivers them. In this article by Rafe Needleman, he interviews Instacart CEO Apoorva Mehta and learns that Instacart isn’t a marketplace for food, it’s a marketplace for labor. In other words, Instacart is selling a grocery-ordering interface paired with micro-contracting services in the vetted Taskrabbit model. Needleman makes the point that Webvan was too early for this kind of service; Instacart is entirely mobile-dependent and the workforce of contractors with their own smartphones (“managed crowdsourcing“) who use Instacart’s proprietary store maps and shopping app are as important a piece as the customers. Will it work? As a part-time homemaker-partner, I was immediately ready to outsource the grocery shopping to Instacart for the absurdly reasonable price of $9.99 for one-hour or $3.99 for three-hour delivery. I was crushed to learn that our Uptown Oakland neighborhood isn’t on their service yet- sensibly, they’re starting out with SF, Palo Alto and Mountainview. And a little more investigation reveals something interesting – a markup on the groceries themselves that’s not mentioned anywhere on the Instacart site. There’s a detailed price analysis on this blog, which is written by the co-founder of a competing business model, so grain of salt. It’s generally described as between “5%“, “gouging” and “a touch” elsewhere. Additionally, in a discussion on Y Combinator’s Hacker News, CEO Mehta proves himself to be a bit of a jerk. Why these startup guys gotta be such jerks? It’s enough to make you cynical about the Internet. This entry was posted in Tech news of the weird and tagged Apoorva Mehta, delivery 2.0, instacart, managed crowdsourcing, micro-labor, SF grocery delivery, Taskrabbit, Y Combinator on February 14, 2013 by Suzanne Forbes. I’ve been waiting for years to go to a grey-market Seoul clinic and get the chip put in my head. Nothing anyone says about people hacking it, boot-up problems, need for regular upgrades, etc., has ever reduced my desire to be an early adopter of this controversial technology. It’s not that I want to be a cyborg, although growing up hearing the exultant words “Better…stronger…faster” gave me a sense of wonder and hope about biomechanical developments. This entry was posted in Tech news of the weird and tagged biohacking, chip in head, cyborg, Google Glass, singularity, six million dollar man, transhumanist on February 14, 2013 by Suzanne Forbes. What does Facebook’s new “Google Killer” Graph Search mean for businesses? Nowadays we tend to talk as if Google sees everything we do, as if the Google search engines spider the entire net while we sleep, mining our data for their ad sales. But actually there’s a cutout in the Googlesphere, an enormous blind spot where what we do, like and share is hidden from Google- and that’s Facebook. In the Facehole-sphere, our billion users’ worth of monetizable actions and choices are indexable only by Facebook, and the Zuck has been working on another way to sell that indexing (aka rescue the Like). Today Facebook announced the beta release of Graph Search, a personalized, “private” social search function within Facebook. You ask Graph Search a question like “What restaurant in Kansas City do my friends like?” and Graph Search takes you to your friends’ content that relates to that question, using your Facebook data. That’s social proof. And Facebook wants to monetize the hell out of it- if you doubt that for a second, I saw on my feed you’re shopping for a bridge and my friends all like this bridge in Brooklyn. these two companies, Google and Facebook, are now battling for your private data, and to some extent they’re both betting on personalization as the future of search. Facebook needs this new function to complete their Ultimate Monetization Strategy because up to now, Facebook data-mining has mostly addressed the only the top of the funnel. “Liking” a brand and “building a relationship” with it in the Facebook sphere are about long-term marketing strategy, creating brand awareness by content marketing and social proof. The difference between recognizing a brand frequently surfaced by social discovery and searching with purchase intent is about placement in the funnel- and when someone searches for a restaurant in SF, they’re likely to be ready to spend money on dinner. The lower in the funnel a lead is, the more likely it is to be converted to business. The idea here is that users with purchase intent will search for a restaurant to eat dinner at on Facebook rather than Google, because the results will be socially mined. But do people want a friend’s recommendation, or do they just want the place that got ok Yelp reviews and is right next door to the movie they’re going to? Is the filter bubble the future of search? Is social proof the only way we’ll make consumer choices in the future? Where there’s discovery, there’s opportunity for sponsored discovery. Though there’s no ads in Facebook’s new Graph Search engine yet, eventually Facebook could let advertisers pay to show their results above organic ones, just like on Google. Is this thing going to take off? Will you finally be able to advertise effectively and invest marketing resources safely on Facebook, once Graph Search is monetized? Guess who doesn’t think so: investors. Earlier today, Facebook unveiled its third pillar, Graph Search. While the announcement was highly anticipated, the unveiling didn’t live up to the hype from the investors’ perspective, as the stock (NASDAQ:FB) is currently down 3.23 percent at 29.95 – below $30 again. Why is this rollout not the investor catnip it was supposed to be? When the social proof marketing land rush is on like Donkey Kong? Because there is a limit to how much we are willing to sell our souls to get timeline views of our posts, and a limit to how much we want to do online, and Facebook is constantly underestimating those limits. For example, last year my partner took me to Rome. At parties, we asked our friends if they had any recommendations for Rome. It wasn’t because we wanted to use that data to make consumer choices. I’d already booked our hotel rooms by aggregating only the most recent reviews from three travel sites. It was because we wanted to see our friends’ faces light up when they told us stories of their experiences, and let their hope and memory and pleasure color our anticipation. Viewing their “Like” icons wouldn’t be the same at all. When will we know the value of Facebook for businesses? What is the value of a Like? Wired predicts “Facebook’s income will not explode as Google’s did 12 years ago when it debuted AdWords contextual advertising.” Experts simply can’t parse how disruptive social proof marketing will be in the next year. And finally, there’s little information about how Facebook will colonize the crucial area of mobile- although this article, released today, tantalizes. We’ll keep you up to date as the situation develops, and hope that business, users and Zuck can all benefit, without anyone having to take their ball and go home. Facebook is working on a plan to allow advertisers to buy mobile ad inventory through FBX, the social network’s ad exchange, two sources tell us. Facebook’s growth will be fussier, depending not on a single innovative solution, but a smattering of them. These are innovations that require a deeper change in thinking among advertisers and other customers, and which, as a result, will take perhaps five or 10 years to begin to realize their potential as business lines. This entry was posted in Tech news of the weird and tagged Google Killer, Graph Search, purchase intent, rescue the like, social discovery, social proof, Zuck on February 14, 2013 by Suzanne Forbes. Great article about a very layered situation. Civic hacking holds promise for resource-strapped cities like Oakland, yet triggers hot buttons around technology democracy and access in a diverse community. How can a city that is struggling to manage day-to-day operations negotiate with a volunteer group of technology specialists, some of whom may have issues with government and authority? 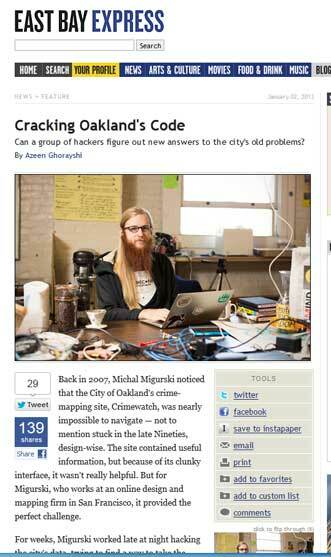 This entry was posted in Tech news of the weird and tagged civic hacking, Oakland Occupy, Oakland Online Engagement Director Nicole Neditch, technology access on February 14, 2013 by Suzanne Forbes. 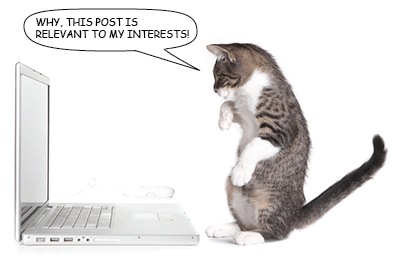 Let’s talk about Content Marketing for 2013, ’cause the stats say it drives traffic bigtime. Recently we’ve discussed the shift in site traffic referrals from primarily SEO-driven to more socially-shared content marketing. Since T324 is a business that has done incredibly successful SEO campaigns for a lot of customers, this shift actually means we need to review our own products and services. What we have been doing simply isn’t working as well as it used to, because the link ecosystem has changed. This entry was posted in Tech news of the weird and tagged content marketing, google data-mining, Google Panda, Google penguin, SEO is dead, social sharing on February 14, 2013 by Suzanne Forbes.